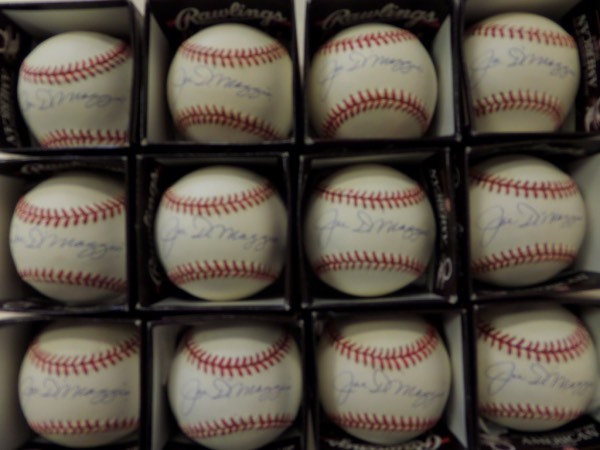 Coach's Corner - ONE DOZEN Joe DiMaggio single signed Official AL Baseballs! Go Back to Lot List ONE DOZEN Joe DiMaggio single signed Official AL Baseballs! This fantastic dealer's opportunity is ONE FULL DOZEN Official American League Rawlings baseballs, each penned on the sweet spot in blue ink by the one and only Joltin' Joe himself, Yankees icon and HOF legend, Joe DiMaggio! Each ball in here grades between VG+ and EX+, and each signature is a legible 8 or better. Each ball has a book value at no less than $600.00, so you do the math. This is the last DOZEN opportunity we have, so this really is your last chance for this incredible investment!